A switched-mode power supply (switching-mode power supply, SMPS, or switcher) is an electronic power supply that incorporates a switching regulator to convert electrical power efficiently D.C. to D.C. converters and D.C. to A.C. Converters belong to the category of Switched Mode Power Supplies (SMPS). • The ac supply is first rectified, and then filtered by the input reservoir capacitor to produce a rough dc input supply. • The unregulated dc is fed directly to the central block of the supply, the high frequency power switching section. • The drive pulses are normally fixed frequency (20 to 200kHz) and variable duty cycle. • This transfer of power has to be carried out with the lowest losses possible, to maintain efficiency. • optimum design of the passive and magnetic components, and selection of the correct power semiconductors is critical. • Regulation of the output to provide a stabilised dc supply is carried out by the control / feedback block. • Generally most S.M.P.S. systems operate on a fixed frequency pulse width modulation basis, where the duration of the on time of the drive to the power switch is varied on a cycle by cycle basis. 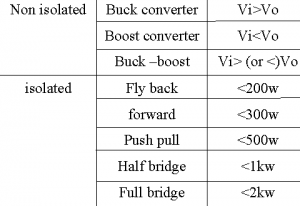 • This compensates for changes in the input supply and output load. • The output voltage is compared to an accurate reference supply, and the error voltage produced by the comparator is used by dedicated control logic to terminate the drive pulse to the main power switch/switches at the correct instance. Correctly designed, this will provide a very stable dc output supply. • It is essential that delays in the control loop are kept to a minimum, otherwise stability problems would occur. Hence, very high speed components must be selected for the loop. • In transformer-coupled supplies, in order to keep the isolation barrier intact, some type of electronic isolation is required in the feedback. This is usually achieved by using a small pulse transformer or an opto-isolator, hence adding to the component count. • In most applications, the S.M.P.S. 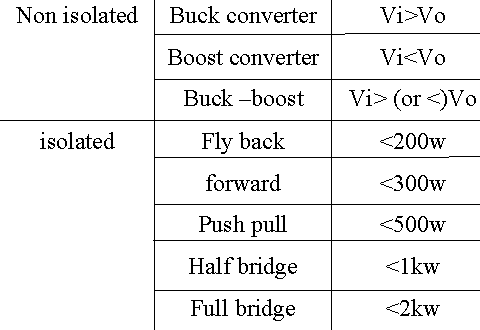 topology contains a power transformer. This provides isolation, voltage scaling through the turns ratio, and the ability to provide multiple outputs. However, there are non-isolated topologies.